A year ago, Casa Gracida was 40 acres of swampland and a few cinder blocks. Now there is a barn, polo field and stables. No house. Just a barn, polo field and stables. “That shows you where our priorities are,” said Mimi Gracida, whose husband Memo is considered one of the world’s greatest polo players. With true polo people, the barn comes first – always. Construction will soon begin on a second barn for brother Carlos. But for now there is too much to do at Casa Gracida. There is the business of readying horses and teams for the winter polo season at the Palm Beach Polo and Country Club, which opens Saturday with the season’s first high-goal tournament, the Cadillac Challenge Cup. There is also the business of improving on perfection. In polo, the measure of a man is his handicap. Every year a U.S. Polo Association committee assigns each player a number of goals, from minus-one to 10. Memo (short for Guillermo), 29, has been a 10-goal (polo’s top ranking) player since 1983. This year he will be joined by his younger brother Carlos, 25, in the elite foursome of 10- goalers with Argentina’s Ernesto Trotz and Gonzalo Pieres – a moment Memo says he has waited a lifetime for. Since he was muy poquito, Carlos wanted to follow in his brother’s footsteps. He watched his every move, his style and his way of handling the horses. “I always wanted to be 10 goals,” Carlos said. “When you start playing polo, that’s what you want, but you don’t know when it’s coming or, even if you will be able to get to 10 goals. That was the main doubt I had, if I was going to get to 10 goals ever. Guillermo and Maria Gracida taught their two sons well while they were growing up in Mexico City. They were taught to be horsemen first. The better the horseman, the better the polo player. Polo is more than a game to them. It is a way of life. They have grown up playing side by side and against each other. In September they played together on the winning team, Carter Ranch, in the U.S. Open in San Antonio. Carlos was named the Most Valuable Player. This past summer in England, Memo, Carlos, and cousin Ruben won Cartier’s International Coronation Cup. Memo was awarded the Pegasus Triumphant as the game’s MVP. They may be cut from the same cloth, but they have their own distinct styles of play. Memo, who plays the No. 3 position, is meticulous. He would rather play consistently with classical moves. Carlos, who plays either the 1 or 2 position, is flashier, always trying the spectacular, fluid move. “I wanted to copy the best,” Carlos says with a smile. “What makes me happy is not the winning, but to watch Carlos play well, up to his standard and ability,” Memo said. “When they play against each other, nobody gives an inch, put it that way,” Mimi said. When he is away from the polo field, Memo spends every waking moment with his horses. He has 36 of them. “Thirty seven if you count Michelle’s pony,” he said with a smile, referring to his 4-year-old daughter’s pony Mariposa (butterfly in Spanish). It was a gift from Memo’s father. A typical morning for the Gracidas is to awake early. “Memo gets up when our daughter wakes him up,” Mimi said. He gets to the barn around 7:30. Before a season starts the Gracidas will ride two or three horses and then practice for six chukkers (roughly 40 minutes), have lunch, work in the barn and then ride two or three more horses and play a few more chukkers before dinner. Once the season begins, the Gracidas will exercise each of their six ponies for the next day’s game, schooling them in tight circles, weaving fancy upfield patterns, going full speed down the pasture just to rein in and pivot at the last moment. They will help the grooms water down the ponies and if any of them require doctoring or dental work, Memo will attend to that, too. Traveling around the world, playing polo year-round, there is very little off-season. Memo and Carlos are known as two of the hardest-working, most traveled professional players in the world. They have temporary digs at a club in Buenos Aires and rentals in Deauville, France and Midhurst, England. Since moving from San Antonio, their home base is Wellington, where Memo rents a house until Casa Gracida is finished. 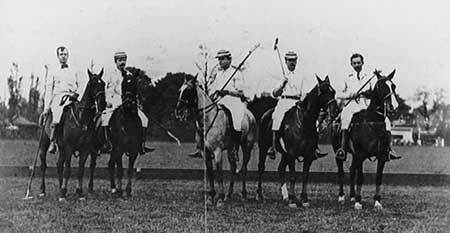 Their father, Guillermo Sr., was an excellent polo player, rated at 9 goals, and so were their five uncles, all rated at 8 goals. Today, Guillermo Sr., at age 65, is rated 5 goals. The family wasn’t rich. Guillermo Sr. raised racehorses. He always managed to keep a couple of horses for Memo and his younger brother. When he was 13, Memo went to his first polo tournament in Monterrey, Mexico. He made his U.S. debut in 1976. Carlos soon followed. Two years later he made his U.S. debut. The first time they played together in the U.S. was the 1980 Gold Cup at Wellington, which they won. Memo had decided to study veterinary medicine. He enrolled at the University of Mexico, playing polo on weekends. In 1976, Mexico was playing the U.S. to reclaim the Camacho Cup, the top Mexican polo title. Gracida, then 19, and rated at 5 goals, was asked by his father, a member of the Mexican team, to go to Houston for the tournament. John Oxley, president of the Royal Palm Polo Sports Club in Boca Raton and a 1-goal player, was playing at the old polo grounds in Lake Worth when he asked Gracida to play for his Boca Raton team. Oxley remembers paying Memo between $3,000 and $4,000 in cash and buying a few horses from him. Today, Gracida earns from $100,000 to $150,000 per month from sponsors. His brother isn’t far behind. After playing a year for Oxley, Gracida went to play for Texas oilman and polo player Steve Gose, developer of the 16-field Retama Polo Center in San Antonio, Texas. Gose is credited with doing more for polo than anybody in the last 10 years. He certainly did a lot for the Gracidas. In turn, the Gracidas did a lot for him. “What didn’t they win? It was just one of those wonderful unions,” Gose said. Gracida made his big move last year, leaving Gose to strike out on his own. He now plays on short-term contracts for a number of sponsors. Gracida never discusses his business deals. One source estimated his total compensation from Gose over seven years was in the “high six figures.” And that doesn’t take into account the money Gracida makes on his own raising and selling horses. Memo may buy a horse for $3,000 to $5,000, work with him, play him and resell him for $18,000, just because it’s Memo’s horse. It is a big markup, but you’re buying a name, a very marketable name. Memo has little time to endorse products, but if he did he could have a field day. Memo Gracida has led teams to victory in everything there is in the sport to win – the U.S. Open five times (Carlos has been on three of the winning teams), the World Cup twice, the British Open, and the Camacho Cup. In 1982, he became the first non-Argentinian member of the winning team in the Argentine Open at Palermo in 30 years. Memo has practiced and played with Prince Charles on his Les Diables Bleus team. When the Prince of Wales finalized his plans for his recent U.S. visit and learned he had time for an exhibition polo match in Palm Beach, the first player he asked to play on his team was Memo. The two practiced last summer at Windsor Castle, using the steps as goal posts. Carlos is following a successful European season, which saw the Hurlingham Polo Association raise his polo rating from 9 to 10 goals. The handicap committee of the USPA followed suit. Carlos was a member of the winning teams in the Piaget World Cup, the U.S. Open, Cartier International Open, the Rolex Gold Cup, the Coronation Cup and the Gold Cup in Deauville, France. “We have won everything there is to win in this sport, everything,” Memo said. Mimi is the daughter of George Oliver, a former 9-goal player who in 1961 had played on the winning side in the U.S. Open with Memo’s father. Oliver coached the now defunct University of Miami polo team through four undefeated years in 1947, `48, `49 and `50 in the Orange Bowl. Mimi first met Memo at a polo game in 1977. Within the year they were married. “I didn’t even know they were seeing each other until they came to visit me in North Carolina to tell me they were getting married,” Oliver said. Through the years, Oliver has watched Memo and Carlos develop into two of the finest players the game has seen. “I think what makes both of them so special is their dedication,” Oliver said. “They work. Not two days a week, or three days a week, but every day, always. “Their father was probably the best horseman the game has ever seen. He had a way of getting to the ball and hitting it, too. And that’s what makes a good polo player. Their father has been more help to them in the horse end of it than I have because he’s been around them longer. But they are both very receptive to any criticism. By criticizing anybody, if you get results, it makes you feel good. They are very easy to work with. The Gracidas will not be playing together until March. Until then, Carlos is playing on the Dallas Carter Ranch team and Memo for Paris Les Diables Bleus. Carlos credits his brother with making the way easier for him. “It was harder for Memo when he was coming up,” Carlos said. “He had to play 11, 12 goals to be rated at 10. They prefer to play on the same team when they can. They hope to win Palermo together one day. “Being his brother opened a lot of doors for me,” Carlos said. “People would say how good Memo was and they saw me coming up and thought maybe I would be good, too. I like playing with Memo. I like playing the best polo I can. I would rather play with him than against him.